The total synthesis of fortimicin B was achieved by glycosylation of a protected a-sugar chloride with a biscarbamate cyclitol . (a) epo-Fortimicins. 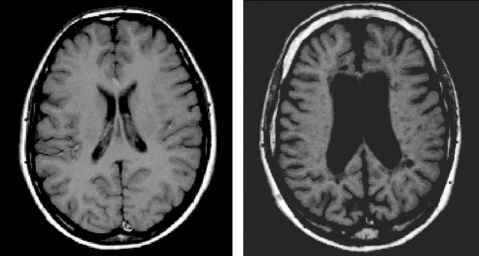 2-O-Mesylfortimicin B has been used to prepare 2-deoxy-fortimicins A and B, and 1-deamino-2-deoxy-2-epi-aminfortimicins A and B. The 2-deoxyfortimicin A was more active than fortimicin A (compound 372), whereas the 2-epi-amino derivative was devoid of any activity . The 2-epi-fortimicin B (compound 373) was prepared by solvolysis of a 1-V-acetyl-2-O-methanesulfonyl derivative of fortimicin B . Also 1-epi-fortimicins A and B (compounds 374 and 375) were synthesized by epimerization of a 2-keto derivative of fortimicin A with subsequent borohydride reduction . 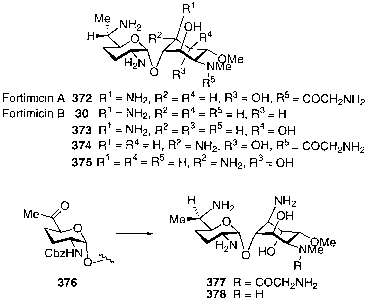 In other work, the 6'-epi-fortimicins A and B (compounds 377 and 378) were prepared by oxidative deamination of the 6'-amino group with V-chlorosuccinimide to get a 6'-keto analog (e.g., 376, partial structure), followed by reductive amination with sodium cyanoborohydride . The 1-epi-fortimicin A (374) showed attenuation of activity against AAC(3)-I producing organisms, and the 6'-epi-fortimicin A (377) showed less activity than fortimicin A (372). On the other hand, the 2'-epi-fortimicin A prepared from 2'-epi-fortimicin B (373) showed improved antibacterial activity. epi- and 3-O-demethyl-2,3-di-epi-fortimicins A were almost half as active as fortim-icin A, and the other analogs were devoid of activity. (b) N-Substituted Fortimicins. Base-catalyzed rearrangement of 3-O-demethylfor-timicin A has led to formation of 1-N-glycyl-3-O-demethylfortimicin B and 3-O-demethylisofortimicin . Other reports have described the syntheses of a wide variety of 4-N-acyl derivatives of fortimicin A  and 4,2'-di-N-substituted derivatives of fortimicin B. These include 2-aminoethyl, glycyl, (S)-4-amino-2-hydroxy-butyl, and (S)-4-amino-2-hydroxybutyryl substituted analogs (compounds 379-384 ) . Among these analogs, the 4-N-substituted derivative 381 was the most potent antibiotic and showed slightly better activity than fortimicin A (372). The other derivatives showed activity comparable to that of fortimicin A but were more active against resistant strain producing AAC(3)-I enzyme. 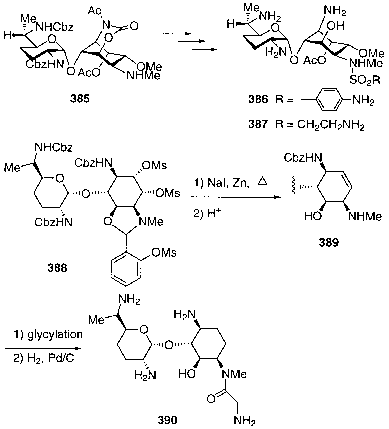 The literature contains descriptions of the 4-N-glycylation of fortimicin B 30 via selective amino group protection  and the selective acylation of fortimicin B and 2-epi-fortimicin B derivatives with N-(N-benzyloxycarbonylglycyloxy)-suc-cinimide , as well as 4-N-acyl to 2'-N-acyl migration of fortimicins under basic conditions . The resulting 2-O-glycyl and 1-N-glycyl analogs, as well as 5-deoxy derivatives of epi-fortimicin A, were devoid of antibacterial activity. Other reports describe the syntheses of 6'-N-methyl and 6',6'-di-N-methylfortimicins A and B by reductive alkylation in the presence of aldehydes , alkylated and acylated derivatives of fortimicins modified at the 1-, 2'-, and 6'-amino groups , and 4-de-N-methyl analogs of fortimicins A and B by the Ruschig degradation method . Of these new analogs, the 2'-N-[(S)-4-amino-2-hydroxybutyl] fortimicin A was more potent than fortimicin A, 6'-N-methylfortimicin A was half as active as the parent compound, and the others were less active or devoid of any activity. Methods have been developed to prepare 4-N-arenesulfonyl and 4-N-alkane-sulfonyl fortimicin B (compounds 386 and 387) from the 1,5-carbamate derivative 385. However, these analogs were found to be devoid of antibacterial activity  (compounds 385-390). 2,3-unsaturated derivative 389 (partial structure) upon mild acid-catalyzed hydrolysis, which after glycylation with jV-(jV-benzyloxycarbonylglycyloxy)-succinimide, and removal of Cbz groups by hydrogenolysis, afforded the title compound 390. The overall activity of this antibiotic was approximately twice that of fortimicin A and showed improved activity against Pseudomonas species. Fortimicin B has been converted to dactimicin (391) by selective formimidation of the 2"-amino group with formimidate hydrochloride in dry ethanol . Another report described the synthesis of a number of fortimicin KG2 analogs, including 3,4-didemethyl, 4-demethyl, and 3-amino-4-demethoxy-4-deoxy derivatives from sis-amine . (c) Other Fortimicin Analogs. 2-Substituted fortimicins, including 2-amino-2-deoxy and 2-chloro-2-deoxyfortimicin A and its 2-epimer (compounds 393-395 ), have been made by stereo- and regiospecific aziridine ring opening of the 2-deoxy-1,2-epimino-2-epi-fortimicin B (392) with chloride or azide. However, all these new analogs were less active than fortimicin A  (compounds 391-395 ).